In the Windows 10 Start Menu, when you click on “Power”, you see the available power options such as “Sleep”, “Shutdown” and “Restart”. 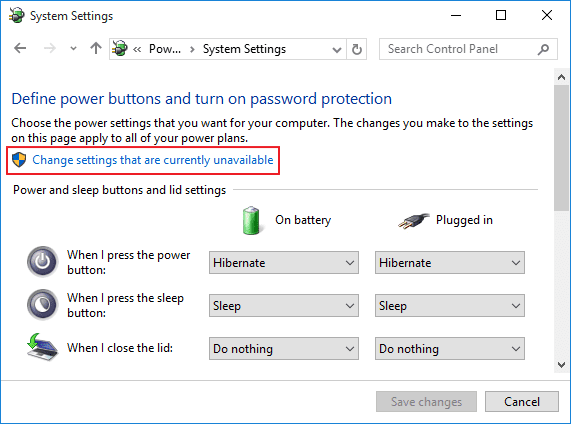 If you want to add the “Hibernate” power option to your Windows 10 Start Menu, it just requires changing one power setting. 1. Open the Windows 10 Control Panel. You can do this by searching for “control panel” and clicking the Control Panel icon. 2. In the Control Panel, use the “Search Control Panel” box to search for “power options”. 3. Then click on “Change what the power buttons do”. 4. On the next screen, click “Change settings that are currently unavailable”. 5. Now scroll down to the “Shutdown settings” section, and these settings will no longer be grayed-out. You will now be able to select which shutdown options appear on your start menu. Make sure the “Hibernate” option has a check-mark and click “save changes”.